Tears leave the eyes for many reasons. A common one is when someone dies. For me, it's neither about people I know nor people I'm close to. Tears find their way down my eyelids when I hear of a friend's loss. A friend could be anybody. Those that I'm close to, those I've come across and those I would have met had they not died. When I hear of a loss, memories of conversations, happy moments and lost opportunities come rushing around to accuse me of not daring to make those moments happier or not grabbing those opportunities. That was the thought that came to accuse me this morning when I heard of Dagrin's death. Then he blew up in the music industry. I bought his CD when I was going on annual leave in December and this CD and Majek Fashek’s “Little Patience” was all I played in my car. I wanted to meet this guy after hearing the album and loving it so much, lewd lyrics or no. I was so ashamed to go back to ask my cousin to take me to this guy. 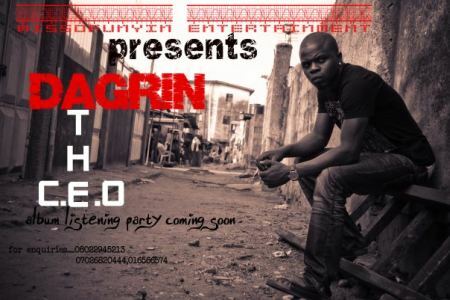 Dagrin’s favourite words influenced the name of his outfit- “MI-so-fun-yin”- I told you so. Those were the words he had for everyone who never gave him a chance. Those words stung my brain this morning and tears left my eyes. He told us so. I hate to think that it was just last Saturday that my cousin told me how Dagrin had gone through a lot at his young age. And how he was the breadwinner of the family at 23. Yet another one just reaching the peak and being told his time was up. Bye bye, Dagrin. I remember another day when I had a reason to cry. June 4, 1997. I'd seen my friend Akin Aboyade-Cole at the bus stop on my way to school. Being my neighbour, I promptly asked him: 'Akin, o si wa l'aye" (Akin, so you're still alive?). That was some crude, naive, secondary-school way of saying "Where have you been?" Little did I know those was to be my last words to him. I saw a 4-litre jerry can with him. He wanted to buy fuel for the car that was to be his death pad. Later that evening, I got the news that he was involved in a freak accident on the grounds of St. Louis Grammar School, Mokola, Ibadan. He'd gone for a party that I somehow found myself not attending for some reason. I wept when the events leading to his death occurred were narrated to me. But his time was simply up. I wished I'd said something positive to him. Now I know better. Every word I say matters. It could be the last for me or for the person I'm saying it to. Yet another day I cried. Quite recently. Biyi Akinwande left us. He was at his peak. A young man just starting out his life. He was traveling home for Easter. He'd just bought a car. He was just building a house. He was planning to go visit his fiancee's parents. He was the breadwinner of his family, his father having departed some years back. Yet he had to die in a freak car accident too. I do not want to leave at my peak. None of these boys wanted to leave at their peak. But when we leave, all others can do is cry. I cried for Dagrin this morning because he left just when things were just going smooth for him. He'd been nominated in many categories for the Hip Hop World Awards, a major milestone his folks at home would have been proud of.And he was billed to go on his first international tour next month. I cried because his family will have to cope with thoughts that maybe If Dagrin had not reached limelight, he would still be with them right now. I cried at the thought of what and where Akin Aboyade-Cole would have been today. How we would have seen each other at GCI reunions and abused each other jokingly. I cried when I remember how Biyi Akinwande told me jokingly that If he'd known I was a GCI boy, he would never have become friends with me.Everyone cries at a funeral for different reasons. What is your reason? Eeeyaaaa. Still sad about DaGrin. Amen, Myne..it's an honour to have had you read my blog..
We will never be ready to heard that someone we knew or were close to has died. When I was told that my brother had died at 47, my world changed, I cry because it wasn't his time, he still had so much plan. We expect life to take its natural course old people die first. We all live like we are immortal, postponing a phone call, a visit ... it is terrible to have to say if I had know we had so little time... I cry for my brother still. Thanks Sibel! You're so so right! Thanks for following!